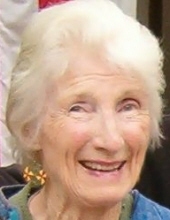 Peggy (Pegram) Elliott of Lincoln, MA passed away peacefully on April 12. Preceded in 2014 by the love of her life, William (Bill) Elliott. She is survived by her children Mark, of Lincoln, MA; William R. (Randy); Jocelyn of Lincoln, MA; and Lawrence of Brooklyn, NY. Services will be held at a time to be determined. Donations in lieu of flowers may be sent to the Lincoln, MA Council on Aging, c/o Town offices, 16 Lincoln Rd., Lincoln, MA 01773. "Email Address" would like to share the life celebration of Peggy P. Elliott. Click on the "link" to go to share a favorite memory or leave a condolence message for the family.